Honoring Real Life Heroes, or, Defying Mother Nature in the Key of “C” | Write Your Own Story! ← Why do Heroes and Heroines Always Have to Lose Their Parents? This is a repost in honor of Veteran’s Day. On this blog I use the term Hero a bit liberally. Obviously, I use the word to (hopefully) inspire ordinary people to become for fully realized versions of themselves. But my use of the moniker Our Hero is ironic, bordering on immature foolery, when I think of my real life Hero, Sgt. Jacob Scherrer, USMC. On Veteran’s Day, it’s important for me to draw a distinction between the metaphorical and the literal with a modest tribute. When I was a kid, my Dad, a real life Hero and World War II and Korean War vet, would take the family to his Marine Corps League picnics. One year in the middle of the big raffle, Mother Nature unleashed a thunderstorm that can only be described as semi-biblical. The skies opened and peppered the attendees with a Terrible, horizontal rain and 75 mph winds that scattered lawn chairs and potato sack race equipment (sacks, mostly). But rather than cower and seek shelter, the Marines – the Few and the Proud – stood at attention, saluted Mother Nature in defiance, and fired back with an aggressive rendition of the Marine Corps Hymn (“From the Halls of Montezuuuuma, to the Shores of Tripoli…..”, in the key of “C” for those of you singing along). Everyone joined in: the feisty old Greatest Generation guys like my Dad, the Vietnam Vets (some of whom may have added a one-finger salute), green enlisted Marines. Even the families; wives and kids, standing, hands on hearts and belting it out. It was one of the most surreal and oddly moving things I have ever seen. And you know what? The Tempest stood down after the third verse. The clouds receded. The sun shone in fear and respect. No little drizzle was going to wreck their corn on the cob, their potato sack race, their big raffle. Not even the Irresistible Force known as Mother Nature can stop Devil Dogs. These guys go into Hell and take on the Impossible because they know they can. Because Marines Believe. The photo above was taken by my Dad some years back. He was excited to go an meet R. Lee Ermey, retired United States Marine Corps Staff Sergeant and host of the Mail Call show on the History channel. Some of you know him better as Gunnery Sergeant Hartman from Full Metal Jacket. The ball busting drill instructor? He was promoting a veteran’s charity at the time, and he visited our town. My Dad was not into Hollywood types or celebrity worship, so I was surprised when he asked me to go with him. This encounter shows the difference between my Dad and me. Dad wanted to meet a man he admired, not just for his entertainment endeavors but for his serious work on behalf of US veterans. I saw an opportunity for an ironic photo with a pop culture icon. When he was just a kid, my Dad was willing to sacrifice his adolescence, his physical well-being, and his life for his country, so that his adult son could have the freedom to take adolescent, ironic photos. It stuck me at the time, and it was humbling. At that moment, I was reminded of the classic line from A Hard Days Night. Old Man on Train: We fought the war for your sort! Ringo: Bet you’re sorry you won. Fortunately, Dad thought the pic was funny too, so I don’t feel like such an ungrateful goof. Ermey was extremely congenial, and Dad and I walked away impressed and very happy, each in our own way. Needless to say, every Veteran’s Day reminds me of Dad, who passed away a few years ago. 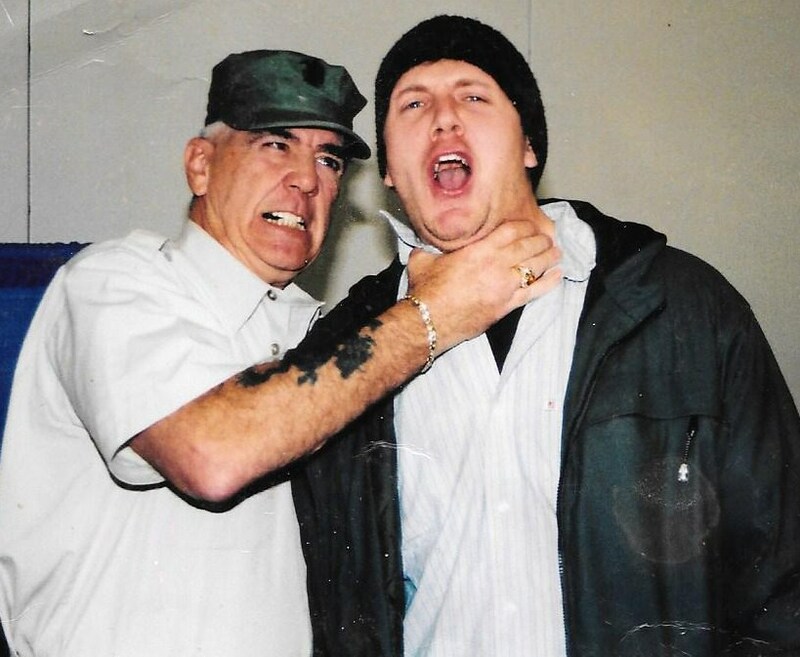 Needless to say, so does R. Lee Ermey. Semper Fi, Gunny. Semper Fi, Dad. This entry was posted in For Inspiration, The Junk Drawer File and tagged A Hard Day's Night, Beatles, Full Metal Jacket, Greatest Generation, History Channel, Mail Call, R. Lee Ermey, United States Marine Corps, Veteran's Day. Bookmark the permalink.